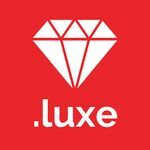 .luxe is a gTLD that was proposed in ICANN's New gTLD Program. It is one of 68 applications that Top Level Domain Holdings Ltd. (TLDH) has filed for on its own behalf. Their application succeeded and was delegated to the Root Zone on 15 May 2014, making TLDH the Registry Operator for the string. .luxe is a generic top level domain targeting luxury brands, products, and designers for fashion, jewelry, other consumer goods; interior designers and stylists; and those who work in and identify with luxury lifestyle such as real estate brokers, bloggers, and investors. This company aims to offer a select group of brands the opportunity to join an elite club of .LUXE domain holders. Applications will be reviewed by a selection committee drawn from representatives of recognized luxury brands. Admission to the domain will be open to those companies approved by the selection committee. "The purpose of the .LUXE gTLD is to offer a premium top-level domain for luxury brands, a US$170 billion industry that caters to the tastes and desires of affluent consumers the world over. By creating a top-level domain that is available only to luxury brands, as recognized by the .LUXE selection committee, to be comprised of recognized and respected tastemakers and representatives of recognized luxury brands, and which by its price will discourage non-luxury goods and services, .LUXE will come to denote an exceptional standard of domain name and product quality. Consumers will, at a glance, be able to identify truly upscale, “.LUXE” websites from ordinary ones. The concept of luxury has been present in all times since the beginning of civilization, and now forms a very important part of the world’s economy. Today, the luxury goods market is estimated at US $170 billion, including drinks, fashion, cosmetics, fragrances, watches, cars, travel, real estate, luggage and handbags. As just one example, the private jet market is growing rapidly, especially in developing nations such as India, where the market potential is expected to reach US$20 billion by 2020. The word “luxury” has 754 million Google hits, and shows up 82,000 times in domains the .com,.org and .net zones – a relatively large number considering the elite nature of the term itself. Indeed, while there are relatively few truly global luxury brands, many other businesses and websites choose to designate themselves with a “luxury” moniker to attempt convey the alleged quality and exclusivity of their offering. The .LUXE top-level domain, however, is not for brands who self-designate as luxury, but for brands recognized as representing luxury by the .LUXE selection committee. The word “luxe,” French for luxury, is understood the world over. Most developed-world countries have signature luxury brands whose name conveys quality and exclusivity. Examples include Louis Vuitton in France, Ferrari in Italy, Tiffany & Co. in the USA, Aston Martin in the UK, Patek Philippe in Switzerland, Porsche in Germany, Kenzo in Japan, and Bang & Olufsen in Denmark. In addition to internationally known luxury brands, thousands of smaller independent jewelers, handbag manufacturers, couturiers, watchmakers, ateliers, boutique hotels, car manufacturers, and other producers and purveyors of exclusive goods and services would qualify and benefit from having a distinct top-level domain that identifies their market segment and their place at the pinnacle of that market. Examples of brands that are highly successful and internationally known but would probably not qualify for .LUXE are Wal-Mart, Tata, Ikea, Tesco, and Аэрофлот (Aeroflot). We specifically examined more restrictive registration policies, such as limiting registration to members of organizations with a specific tie to luxury. For .LUXE, we believe that such limitations are justified and appropriate, because vendors of luxury goods and services define themselves as being uncommon, and exclusive. " On 09 January 2014 TLDH received a Registry Agreement signed by ICANN for .luxe after passing all the required processes needed to become a Registry Operator for the string. .luxe was delegated to the Root Zone of the DNS on 15 May, 2014, completing the successful application for the string. This page was last edited on 14 November 2017, at 22:18.